Marty Robbins has a birthday anniversary this month—his 93rd, in fact. But, sadly, Marty died on December 8, 1982. He’d suffered his third serious heart attack a few days prior, but he didn’t survive the surgery to repair the damage. I was living in Cleveland, Ohio and running thoroughbred race horses at Thistledown Racetrack when I heard it on the radio. The DJ broke down and cried. I cried along with him. Martin David Robbins was born in Glendale, Arizona on September 26, 1925. When WWII broke out, Marty joined the Navy. While serving, he taught himself to play the guitar. When the war was over, Marty returned home and embarked upon a singing and performing career around Phoenix in nightclubs, on the radio, and on television. By the end of the 1940s, Marty had his own radio program, “Chuck Wagon Time”, and a television show, “Western Caravan”. By the mid-1950s, he was invited to the Grand Ole Opry radio show and was a regular performer for many years. He signed with Columbia Records in 1951 with his first Number 1 song coming in 1956, which was Singing the Blues. El Paso released in 1959, and it garnered him his first Grammy Award. With the 1960s came, he pursued racing with such a passion that he progressed to NASCAR racing. It was in 1969 that he suffered his first heart attack. He recovered quickly and wrote, My Woman, My Woman, My Wife, which earned him his second Grammy. Then his second heart attack occurred in 1981. Marty was inducted into the Country Music Hall of Fame in 1982. His last song was a single that same year—Some Memories Just Won’t Die—a bittersweet irony. Over the span of his career, he recorded over 500 songs and 60 albums. Discography information is HERE and HERE. Individual songs information is HERE. When he was growing up, Marty wanted to be a cowboy singer like Gene Autry, and he credits his grandfather, “Texas Bob Heckle”, a traveling medicine show salesman and story-teller, as the main inspiration for many of the songs he wrote later. When I was growing up and listening to Marty’s music, I wore out at least two 45 rpms of “El Paso” on Side A and “Strawberry Roan/160 Acres” on Side B. Marty’s gunfighter ballads influenced my love of the Old West. If I had to choose one artist’s music as the only music I could listen to, Marty Robbins would be that person. Yes, I love his music that much, and my musical tastes range from Vivaldi to Lin-Manuel Miranda’s ‘Hamilton’ and everything in between. Marty was (still is) so influential to my writing that my historical western romance novel with Prairie Rose Publications, The Comanchero’s Bride, was inspired by his song, Meet Me Tonight in Laredo. This book is my little way of paying tribute to Marty and how much his gunfighter ballads mean to me. I sprinkled hints to many of his gunfighter songs throughout the story. Below is an excerpt from The Comanchero’s Bride. For those of you familiar with Marty’s gunfighter ballads Running Gun and Big Iron, you’ll likely notice the small references. At the livery, Mingo remained in the shadows where he could see both ways along the street. Opening the wagon doors just wide enough to allow him to pass through, he eased his way inside. Speaking in a low soothing tone to his horses, he packed and saddled them under the moonlight coming in from two windows. Opening half the double doors, he led the two riding horses out the back, tied them to a corral rail, and returned for the packhorse. He no more than reached the packhorse when a cold voice in the shadows stopped him in his tracks. Mingo froze. A few more steps and he would have been on the off side of the packhorse, but where he was, he had no protection. “You know me. But who are you? What do you want?” Mingo didn’t care. He knew the challenge from the shadows was a bounty hunter. He needed the man to talk so he could pinpoint his location. From the sound of the man’s voice, he hadn’t moved and was off to his right. Mingo fought the urge to whirl and fire, but shooting blindly was not his way. He wouldn’t risk wild shot that could injure a horse, and gunfire would bring others into the fray. Shadows were both his enemy and ally, depending upon how he used it. “The way’s clear behind you, so back towards the open wagon door, and keep your hands away from your body. When I heard the talk of a Mexican man traveling with a white woman, and they were staying at the hotel, I figured I’d hit pay dirt. I was just supposed to worry you into making a wrong move. Never thought I’d be the one to catch you. Now, he knew who he was up against. Earl Johns was vicious and a killer, a back-shooting coward. Mingo inched backward, buying thinking time. “She’s too close for your comfort.” Elizabeth’s voice cut through the night. The sound of a shotgun hammer pulling back was an angry, lethal sound that made the hairs on Mingo’s arms prickle. The Comanchero's Bride is available on Amazon.com. 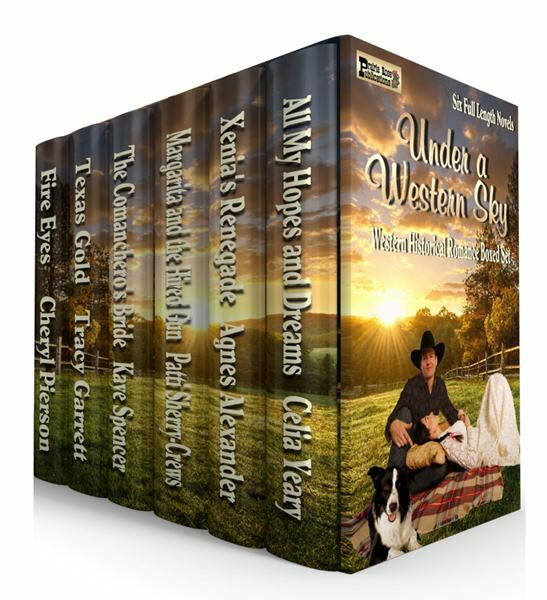 six full-length historical western novels. For your listening pleasure, here is Marty singing Meet Me Tonight in Laredo. Do you have a favorite Marty Robbins song or story? Please share. I'd love to read about it. Marty Robbins Biography. Biography.com Editors. The Biography.com website. A&E Television Networks. http://www.biography.com/people/marty-robbins-20651271. April, 2, 2014. Accessed September 9, 2018. Marty Robbins website. http://www.martyrobbins.com. Accessed September 9, 2018. Country Music Television, Inc. http://www.cmt.com/artists/marty-robbins/biography/. Accessed September 9, 2018. 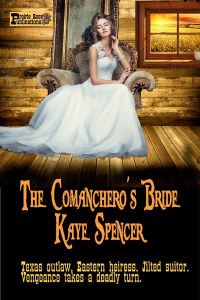 Kaye, I knew the minute I read your story The Comanchero's Bride who you had in mind. I'm a huge Marty Robbin's fan too. When I was riding my tricycle around I clipped the corner of my 45 record of El Paso. I still remember the horror of seeing the side of that record laying separated on the floor. I cried and cried, because I played El Paso about 100 times a day on my little red and white record player. My dad went out and bought me a new one the next day--and who knows how far and wide he had to hunt for it. I think I still have that 45 record in my collection somewhere. I love Marty Robbins's voice so much--and I think he was greatly overshadowed (as was Ricky Nelson) by the Elvis hype. But Marty goes with me in my car and when I drive he's who I listen to. I can't put him on when I'm working because it distracts me from my work, but any time I listen to music, he's definitely one of the ones I listen to. There is just something so comforting in his voice. Love that man. Thanks so much for this wonderful piece on a great artist who was gone far too soon. Sheesh. Marty ROBBINS, not ROBBIN'S ...sigh. *sigh* Yes, he died way before his time. So many great artists did. I agree that Elvis overshadowed many worthy, if not more talented, singers. Marty's music goes with me, too, when I travel. I was a teenager when I heard El Paso on the radio for the first time and it was instant love. Marty and Jim Reeves were my favorite country singers then and remain to this day. Marty nudges into first place, though because of the many wonderful songs he wrote. Now I'll be playing Marty's songs all day...and I have to dig out your book and read The Commanchero's Bride....love the excerpt. Jim Reeves. Slim Whitman. Marty Robbins. All of them were great, but Marty is my favorite. I remember our local AM radio station, KFTM, played El Paso a lot, which tickled me to pieces. I meant to add that I used Marty's song, My Woman, My Woman, My Wife in a workshop I held years ago (along with Garth's That Summer and one other song I can't remember right now). The participants were to close their eyes and listen to the words, then write down what they "saw". There is so much pain and suffering in that song and love, too. I so love Marty's ballads, but that one is a tear-jerker. My Woman, My Woman, My Wife... I challenge anyone to listen to that song and not get teary or just out and out bawl like a baby. Marty was a brilliant writer. I am enthralled with oral storytelling, and you hit it right on the nose. Marty was certainly a musical storyteller.